I am catching up on posting, so this story is from a week and a half ago, just after Easter. For now I’ll write details, and later I can write more reflection about my experiences. 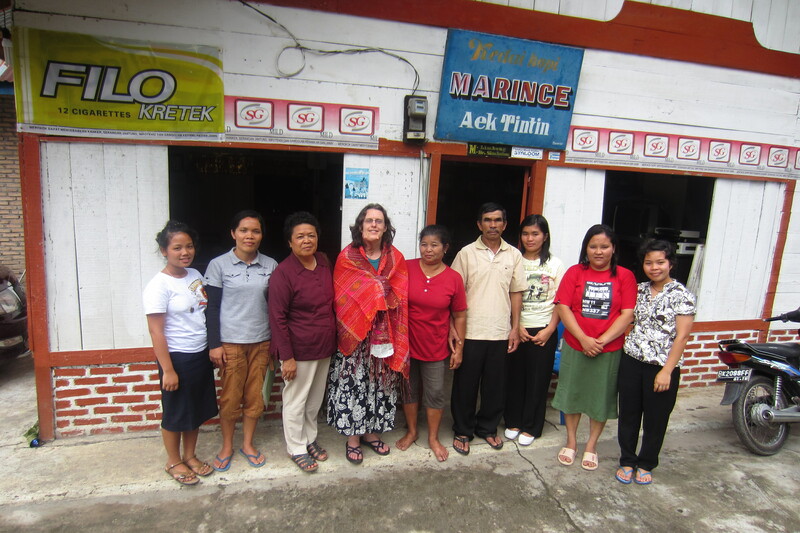 On Easter Sunday, after lunch, I traveled around Lake Toba with some of my sisters from the school. 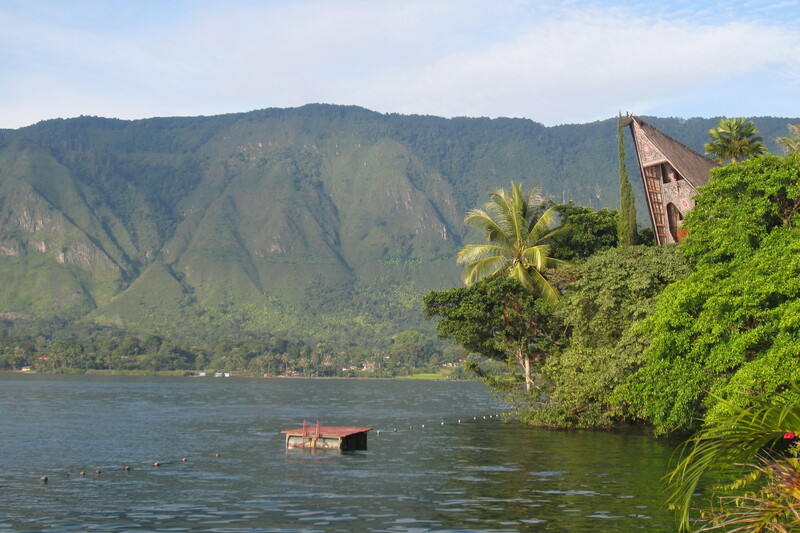 From Balige we drove to Parapat and took a ferry across the lake to Samosir island in the middle of the Lake. After a restful night at a beautiful spot by the lake, we drove on a windy road up the mountains. On Monday, the 9th of April, after some sightseeing, we were invited to lunch at the home of one of the students. The Ibu (mother) had prepared a meal of chicken, boiled eggs, dried fish, and soup, together with rice that I’m told had just been harvested. All together, we ate in a circle on large mats on the floor. I was asked to pray in English before the meal, but because I do not speak the Batak language, most of the time I listened but did not understand. The food was prepared in sauces, and all tasted very good, but it made my lips and mouth burn. I have heard it said that in Indonesia, they are not satisfied if the food does not have hot chilis in it. As is custom in Batak culture, I was treated well as a guest. They are welcoming, and always offer and make sure I have enough. After lunch we drank coffee. I formally thanked Bapak and Ibu (father and mother) for the meal and their generous hospitality and prayed for God to bless them. I told them I was looking forward to teaching their daughter. The family invited me again to be a guest in their home and they gave me an ulos. An ulos is a special woven blanket used by the Batak people in parties, ceremonies, or even as decoration. There are many different kinds of ulos, and variations depend upon the the different tribes within the Batak people. 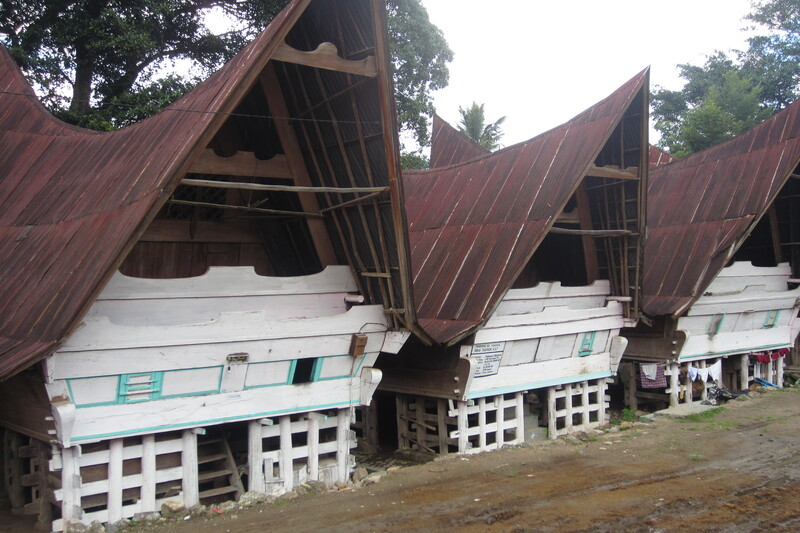 This ulos is of Toba Batak. It was a great honor for me to be welcomed so warmly. They opened their home to me, and although we do not speak the same language, we are family in Christ. I am so grateful for this experience and for their gift of the ulos.